Similar to the Siva Lingam in headquarters of Christianity (Vatican in Rome) at the headquarters of Islam too (Kaaba temple in Mecca city of Saudi Arabia) the ancient Hindu Siva Linga is still present. There is reference to king Vikramaditya comes in an inscription found in the Kaaba at Mecca. The text of the inscription, found inscribed on a gold dish hung inside the Kaaba shrine, is said to have recorded in a volume known as Sayar-ul-Okul (meaning, memorable words) treasured in the Makhtab-e-Sultania library in Istanbul, Turkey. 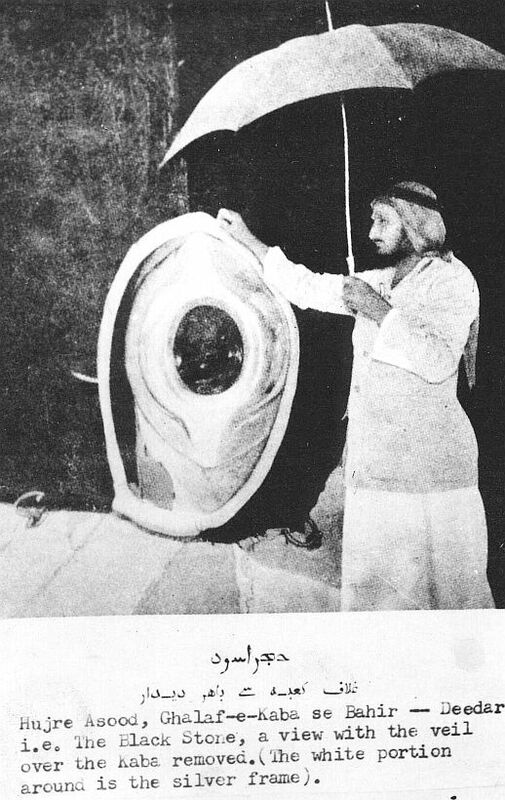 The Kaaba cylindrical stone, rendered immovable for security by being fixed in the outer corner of a wall, is the object of reverence of all Muslims. Here Muslims still continue the seven perambulations in the age old Hindu style except that they move anti-clockwise (similar to arabic and urdu languages written from right-to-left). White silver foil shrouds the stone. The oval uncovered central portion gives the pilgrims an idea of how the stone looks. Syrians had once carried away the stone as a war trophy and kept it for 22 years. As the pilgrim proceeds towards Mecca he is asked to shave his head and beard and to don special sacred attire that consists of two seamless sheets of white cloth. One is to be worn round the waist and the other over the shoulders. Both these rites are remnants of the old Vedic practice of entering Hindu temples clean and with holy seamless white sheets. Even in traditional vedic marriages, seamless white clothes are worn around waist (as dhoti) and on shoulders by bridegroom. The main shrine in Mecca, which houses the Siva Linga, is known as the Kaaba. It is clothed in a black shroud. That custom also originates from the days when it was thought necessary to discourage its recapture by camouflaging it. The practice of taking seven steps- known as Saptapadi in Sanskrit, is associated with Hindu marriage ceremony and fire worship. The culminating rite in a Hindu marriage enjoins upon the bride and groom to go round the sacred fire four times (but misunderstood by many as seven times). Since “Makha” means fire in Vedic Astrology, the 7 circumambulations also prove that Mecca (distorted word for Makha) was the seat of Indian fire-worship in the West Asia. Islamic practice of Bakari-Eed (Eid al-Adha) or Bakrid derives from the Go-Medh and Ashva-Medh Yagnas of Vedic times. Eed in Sanskrit means worship. The Islamic word Eed for festive days, signifying days of worship, is therefore a pure Sanskrit word. Unfortunately Go-Medh and Ashva-Medh were termed as cow and horse (animal) sacrifices by recent historians, but infact they were cow and horse worship traditions. Medh also means sacrifice but the offering in fire was not animal’s head. Few people have took the wrong meaning and started offering goat/lamb meat on this day of Bakari-Eed, where bakari is pure hindi word for goat. Many Islamic traditions and practices like the islamic festival ‘Eid-al-Fitr’ derives from the ‘Eid of Piters’ (pitr means ancestors in sanskrit) that is worship of forefathers in Sanskrit tradition. In India, Hindus commemorate their ancestors during the Pitr-Paksha that is the fortnight reserved for their remembrance. The very same is the significance of ‘Eid-al-Fitr’ (worship of forefathers). The Islamic practice of observing the moon rise before deciding on celebrating the occasion derives from the Hindu custom of breaking fast on Sankranti and Vinayaki Chaturthi only after sighting the moon in evening. Barah Wafat (Milad-un-Nabi) is festival for commemorating those dead in battle or by weapons, derives from a similar Sanskrit tradition because in Sanskrit ‘Phiphaut’ is ‘death’. Hindus observe Chayal Chaturdashi in memory of those who have died in battle. The word Arabia is itself the abbreviation of a Sanskrit word. The original word is ‘Arabasthan’. Since Prakrit ‘B’ is Sanskrit ‘V’ (like Vanga became Banga or Bangla and Vihar became Bihar) the original Sanskrit name of the land is ‘Arvasthan’. ‘Arva’ in Sanskrit means a horse and it signifies a land of horses, and as well all of us know, Arabia is famous for its horses. Four months of the year are regarded as very sacred in Islamic custom. The devout are enjoined to abstain from plunder and other evil deeds during that period. This originates in the Chaturmasa i.e the four-month period of special vows and austerities in Hindu tradition followed between a period when Sun transits between Virgo (Kanya Rasi) till Sagittarius (Dhanus Rasi) according to Vedic Astrology. Shab-E-Barat is the corrupt form of Siva Vrat and Siva Ratra or Siva Ratri. Since Eed means worship and Griha means ‘house’, the Islamic word Idgah signifies a ‘House of worship’ which is the exact Sanskrit connotation of the term. Similarly the word ‘Namaz (means prayer)’ derives from two Sanskrit roots ‘Nama’ and ‘Yajna’ (NAMa yAJna) meaning bowing and worshipping. Even the body pose using during Namaz is same as Vajrasana pose in Yoga. Allah is combination of Al + Ilah and in arabic Al is male energy, Ilah is female energy of the supreme creator. This is similar to the concept of Ardhanareeswar in vedic tradition or Ying-Yang symbol of east asian countries. Tripura Rahasya, Devi Bhagavatam clearly state that this creation started from male and female energies (Trimurtis and their wives) which emerged from Devi (Tripura) who is the origin on entire creation. “786” is the total value of the letters of “Bismillah al-Rahman al-Rahim“. 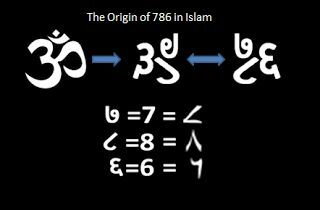 If you take the numeric values of all the letters of the Bismalah, according to the Abjad (original) order, the total will be 786. In the Indian subcontinent the Abjad numerals became quite popular. People mostly in India and Pakistan, use 786 as a substitute for Bismillah. They write this number to avoid writing the name of Allah or the Qur’anic ayah on ordinary papers. This tradition is not from the time of the Prophet Muhammed but originated much later.